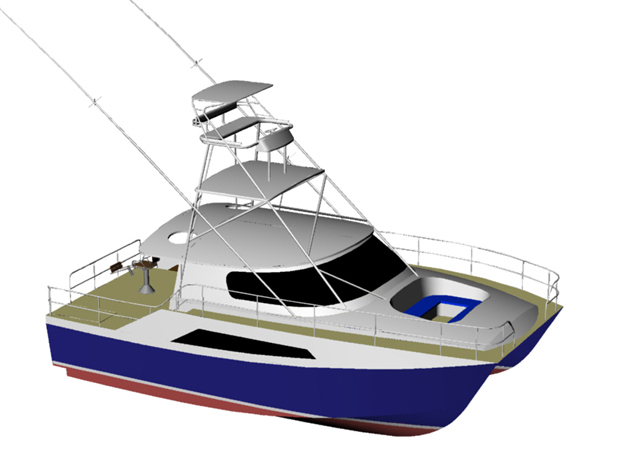 P37x BigGame is a boat especially dedicated to sporting fishing with large fish, marlin, swordfish, sea-bream, tuna. The hulls studied for speed, with a V constant on almost a half the length guarantee an unquestionable aptitude for planning, while the V very marked of the stems as well as the very high platform above water allow easy passage in the waves. Despite everything, it livable with two beautiful cabins, each one is equipped with a bathroom, and a very pleasant area for sunbath for the ladies when the genthemen are fishing. The back platforms constitute an originality since it closes the cockpit in position navigation, and release then two descents towards the sea, true springboard for transparent water of the Caribbean. Another originality, the propulsion is carried out by hydrojet.